„Meaning and Computer Games“ – vom 14. bis zum 17. Oktober dreht sich an der BTK Berlin alles um die Philosophie hinter dem Computerspiel. 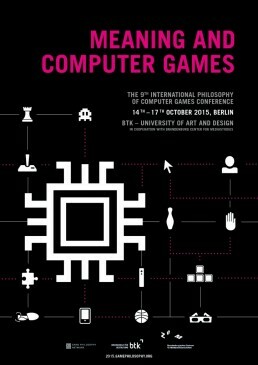 Die neunte internationale Konferenz rund um „Philosophy of Computer Games“ richtet sich an Studierende und Interessierte aller Fachbereiche, die sich näher mit dem Hintergrund des Gamings beschäftigen möchten. Die diesjährige Veranstaltung widmet sich vor allem der Erkundung der sozialen und kulturellen Sphären der beliebten Beschäftigung. The 9th International Conference on the Philosophy of Computer Games will explore how meaning phenomena contribute to the nature and socio-cultural role of computer games. How do games convey meaning? Which models of meaning-making (e.g. semantics, semiotics, hermeneutics, rhetoric, logic) should we apply to computer games in general or to individual games? Which methods of interpretation should we use to understand computer games? By answering questions such as these, philosophy will identify theories, concepts and practices that will aid the understanding of good game design.